This is not about global warming. I need not make the case that humans are in trouble. We are in trouble. Civilization will collapse. The only question is when. Billions will suffer and die. Such a collapse may be the only thing to save us from extinction. The problems humans face are baked into how we act, think, and are. No small fix, no technological miracle, no increase in efficiency will change this outcome. Not all humans are equally responsible for the mess we are in. A few ruin it for everyone else. As individuals, we are part of the problem or part of the solution. Which side am I on? Humans are doomed because 1% of the world’s population cannot but live modern privileged energy-intensive lives. The correlation between wealth and energy consumption is strong. Of the 7.7 billion humans alive in the world today, one percent or 77 million people, have a wealth of at least $871,320 in 2018. About 80% of US households have accumulated such wealth. Ten percent of the world’s population has wealth above $93,170 in 2018. They too are wealthy and live privileged energy-intensive lifestyles. Those who have wealth control the system. I don’t think of myself as wealthy but am part of the 10% that maintains the system as it is. 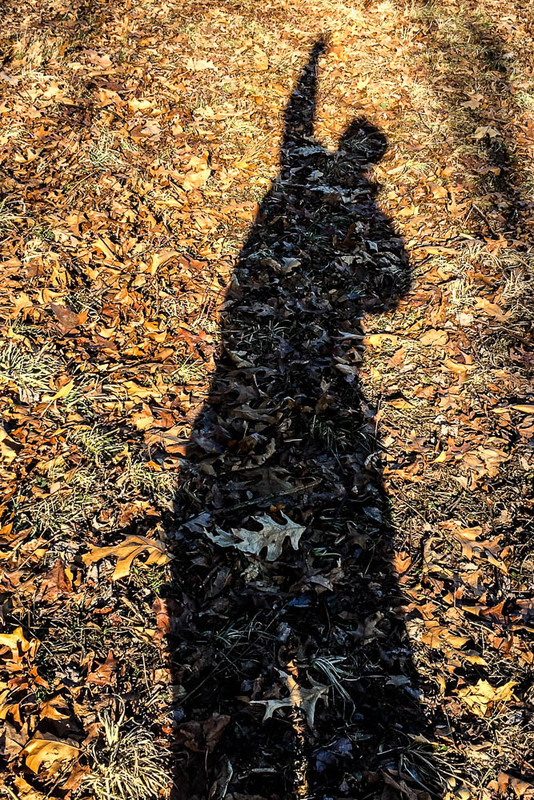 I’ve gone through my carbon expenditures and minimized them where possible but living in the US adds 8.5 tons of carbon each year besides whatever carbon I release directly. An MIT study provides data on how much government services contribute on my behalf. I am part of the problem no matter how little pollution I release. 20% of the world’s wealthiest citizens consume most of the Earth’s renewable resources. The consume most of the Earth’s renewable resources. The rest of the world’s citizens bring that consumption to more than what the Earth’s biosphere can produce, so that humanity borrows resources from the future. It’s called Earth Overshoot day. In 2018 it fell on August 1st. Humanity borrows the renewable resources used from August 1st to the end of the yearfrom the future. If everyone on Earth were to live a lifestyle that US citizens enjoy, the Earth overshoot day would be March 15th. That’s over four times the renewable resources that the Earth’s biosphere can produce. 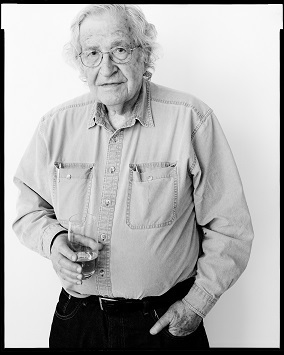 Capitalism, the political-economy of the Modern World, is running civilization into the ground. People the world over are doing what they can to get and maximize privileged energy-intensive lifestyles similar to the lifestyles enjoyed by people here in the US. The Earth’s inhabitants can only steal so much from the future before the ecosystem breaks The results would not be pretty. What can be done? Deny others the privileges we give ourselves? The wealthiest 20% are not happy and want more. China and India want material lifestyles like ours. Everyone wants to be unhappy. The privileged energy-intensive lifestyles we enjoy are absurd and unsustainable. More absurd is that people take this state of affairs for granted and think it’s normal. The math is simple. A civilization that can’t contain its consumption habits will destroy the environment on which it depends and crash. Environmental overshoot has been the downfall of many a civilization. We are the first civilization that covers the entire Earth. It’s never happened on this scale. While overpopulation is a factor, most of the problems come from wealth and the consumption of resources that wealth makes possible. There would be no overshoot day if everyone in the world lived lifestyles like the peoples of Africa. 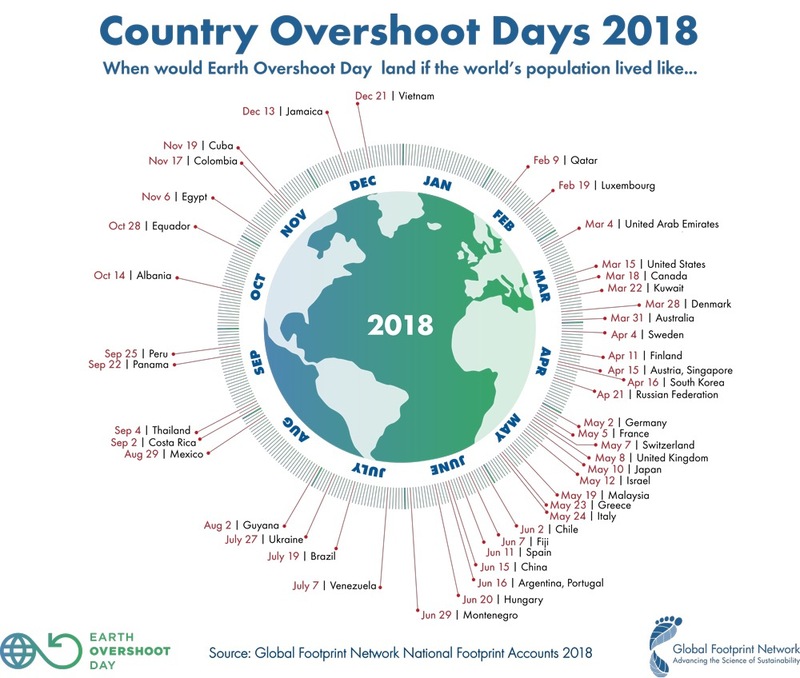 The only African country on the overshoot day graphic is Egypt. Collectively the poor in Africa number close to 20% of the world’s population while producing less than 3 percent of the world’s greenhouse gasses. Remember that the next time someones says the problem is overpopulation. What can we do? Individuals could use less energy. There is pressure to reduce the amount of energy use, to make things more efficient but much of that innovation ends up in increased consumption. Given the libertarian convictions of modern individuals, the prognosis does not look good. The situation we are in is like a lung cancer patient who refuses to quit smoking. It is difficult to get a good perspective on the Modern World that we humans have created. We use our experience to measure the passing of time. A few generations back seems a long time ago and would appear to be another world. A few generations from now is unimaginable. Geologic time measures the passing of time since the beginning of the Earth. The beginning to the end of the human race is a mere blip. Cosmic time is vaster still. In For a Future I start off by explaining global warming. Climate Change or global warming is but one of the nine environmental thresholds on which the diversity of life in the Earth’s biosphere depends. According to the Stockholm Resilience Centre, of the nine planetary boundaries, four of the thresholds have been breached. In the case of global warming, CO2 in the atmosphere keeps the sun’s energy from leaving the planet. A warming planet causes the climate to change. Humans have emitted CO2 into the atmosphere for as long as they have used fire to meet their survival requirements. The Industrial Revolution greatly increased the direct and indirect energy individual humans consume to survive. Individual energy usage increased further in post-World War II societies that the consumers in today’s developed world take for granted. Most of the greenhouse gasses have been released since the last World War. It’s been a little over two years since I finished For a Future. Oh well.